When you start to get bored of eating the same old eggs and bacon for breakfast on your ketogenic diet, this smoked salmon keto avocado toast should be the first thing you try before throwing in the towel. Unlike the versions you see when you scroll through social media, this one is low in net carbs, rich in healthy fats, and far more unique. This will change how you eat breakfast everyday. And with a little help of some meal prep and baking your loaf of keto bread at the beginning of the week, this delicious breakfast can be made in a matter of minutes each morning. This will help keep you on track and prevent you from going off plan. It is great for on-the-go eating, is rich in healthy fats to fuel you, has fiber to improve your digestion, and contains just the right amount of protein to sustain your morning. Eggs are the obvious choice for protein in the morning, but they can get real boring, real fast. Instead of hard boiled eggs, scrambled eggs, over easy eggs, or even sunny side up eggs, mix things up with some smoked salmon in the morning. It’s easy to find at any market, versatile, and a good source of quick and easy protein. You’ll also benefit from other nutrients it provides. Like fresh salmon, smoked salmon contains the same healthy DHA and EPA omega 3 fatty acids. This type of fat can reduce your chance of heart attack and stroke, boost your brain power, reduce inflammation, and may even lower your cancer risk. A little goes a long way with salmon. Not only is it rich in healthy fats, but a small 3 oz portion also provides 15 grams of quality protein. Protein is critical for optimal health and the building block for your body. Your body uses protein to help build and repair tissues, used to make hormones, and is needed to build muscle, bones, cartilage, and skin. One of the most important things to remember on a ketogenic diet is consuming enough electrolytes. Most people are taught that sodium is bad for you, but it is an essential mineral your body needs to function properly. Electrolyte imbalance is also the most common issue with those transitioning to a ketogenic diet. Smoked salmon has a high sodium content so it can help replenish and balance your electrolytes which will prevent keto flu symptoms. No more feeling envious of all those beautiful avocado toast creations on social media. This one is not only gorgeous, but it’s filled with far more amazing nutrients. 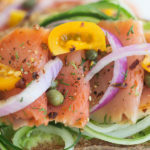 You will never think breakfast is boring when you have this smoked salmon keto avocado toast on the meal plan for the week. Generously butter two slices of Perfect Keto almond flour bread and toast until golden brown. Scoop out avocado onto each slice of bread and mash with a fork. Sprinkle with salt and pepper. Add cucumber and smoked salmon slices. Add a pinch of red pepper flake and more salt/pepper. Garnish with capers, fresh dill, and red onion.